And in frustration I ignored the mess and stitched! LOL. No need for my worktable when I was stitching! This is a Crab apple hill pattern. You can find it here on our webshop. It was such a fun stitcery to stitch! I have even started another new project.... We got this lovely fabric line in at the shop yesterday- Little black dress from Moda- it is absolutely gorgeous!!!!!!!!!!!!! Well- I better keep sewing those blocks, thanks for stopping by! 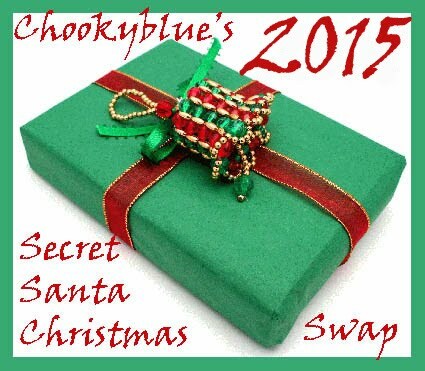 (who knows- maybe my Secret Santa even reads this......) Oh I just love the Secret Santa Swap!!! I do love that stitchery........now how am I going to get a pattern??? I think that particular mess happens to us all, and it is so good after we stop to clean it up. Lovely stitchery. Love your stitchery and your work table!!! That new line of Moda is so pretty. Speaking of cleaning up my work table is calling! That 'mess' is tidy compared to my area. I love the stitchery.